With deep regret, Bud Colquhoun announces the passing of his sister Shirley on March 16, 2018 at Teck Pioneer Residence in Kirkland Lake where she has resided since 2012. Shirley is survived by brother Bud, dear friend Betty Ann Robbins and cherished nursing school classmates Anne McKee and Trudy Walker. Pre-deceased by parents Stewart Colquhoun and Florence (Leggott) Colquhoun, sister-in-law Gwen Colquhoun, eleven first cousins, dear friend Arnold Pilsworth and generations of her beloved dashshunds. Shirley attended Krugerdorf elementary school, skipping a couple of grades before graduating from Englehart High School at the age of fourteen. 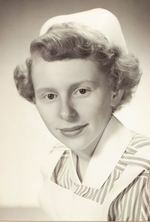 She then enrolled at Hamilton General Hospital School of Nursing, graduating in 1955 as a registered nurse. Other than her nurse's training in Hamilton, she spent her entire life in Englehart as a caring nurse, first at the old hospital (now Northview Nursing Home) followed by many years at Englehart & District Hospital from where she retired in the early 1990's. Much involved in her community as Secretary to Emmanuel United Church, Englehart Nordic Ski Club, Meals on Wheels Coordinator, United Church and Community Choirs and other volunteer activities. Shirley and Arnold loved skiing, cycling, bird watching, reading and caring for her beloved dashshunds. She had toured Europe, the Channel Islands, England and Scotland and visited the Bahamas and Jamaica in earlier times. There will be a visitation at McDonald Funeral Home, Englehart, Tuesday March 20, 2018 from 2 - 4 p.m. Spring burial at the Englehart Cemetery. In memory contributions to the Englehart and District Hospital Fund or the charity of your choice would be appreciated. To send flowers to the family of Shirley Eileen Colquhoun, please visit our Heartfelt Sympathies Store.